Cardiac magnetic resonance imaging was the primary investigation technique for evaluation of RV hemodynamics [13–15]. Patients were examined in the supine position using retrospective ECG triggering with a 1.5 T Philips Achieva scanner (Philips Healthcare, Best, The Netherlands) or 1.5 T MAGNETOM Aera (Siemens Healthcare GmbH, Erlangen, Germany). Steady-state free precession cine images covering the entire heart was acquired. Typical imaging parameters for Philips scanner were TR/TE: 2.8/1.4, flip angle: 60°, slice thickness: 8 mm, no gap, reconstructed spatial resolution: 1.4 × 1.4 × 8 mm3, acquired temporal resolution 47 ms and for the Siemens scanner TR/TE: 2.7/1.2, flip angle: 70°, slice thickness: 8 mm, no gap, reconstructed spatial resolution: 1.2 × 1.2 × 8 mm3, acquired temporal resolution 43 ms. 2D through-plane flow measurements were performed in the ascending aorta and pulmonary artery to measure the effective stroke volume (SV) and pulmonary regurgitation. The freely available software Segment (http://segment.heiberg.se) was used for all image analysis . Optimal timing of PVR due to severe PI in TOF is still a subject of debate as beneficial effects of PVR have to be weighed against the risk for repeat PVR. Performing PVR early during follow-up could be associated with an improved RV remodelling [18–21], but it may increase the number of surgical interventions during the patient’s lifetime and increasing the accumulated risk of procedure-related complications. However, Vliegan et al. has previously shown that RV volumes were significantly reduced after PVR in adult patients with corrected TOF  and attempts have been made to find a cutoff where the RV does not normalize postoperatively in order to facilitate the decision for optimal timing of intervention. Cut-off values for indexed RV end-diastolic volume (RVEDV) between 150 and 170 ml/m2 have been proposed as an indication for PVR in asymptomatic adults with congenital heart disease with previously corrected TOF. Therrian et al. has previously reported that the RV does not reach normal volumes following surgery if the preoperative RVEDVI exceeds 170 ml/m2 . Similarly, in children a cut-off of 200 ml/m2 has been shown to predispose for an incomplete reverse remodelling . According to the current guidelines [10, 11] normalization of RVEDVI becomes more unlikely when the preoperative RV volume exceeds the cut-off of 160 ml/m2. In the current study, the preoperative mean RVEDVI was 161 ± 33 ml/m2. The majority of the patients did not reach normal RVEDVI (≤ 99 ml/ m2) 6–12 months postoperatively as assessed by MRI. This incomplete pattern of reverse remodeling could also be shown for patients with RVEDVI lower than the cut-off of 160 ml/ m2. However, a significant reverse remodeling was present in all patients despite not reaching normal postoperative RV volumes. In addition, RVSVI decreased after surgery, reaching normalization. Data in the present study showing early RV reverse remodeling are consistent with those of previous studies [18, 25–28]. In a meta-analysis including 48 studies involving 3118 patients, Ferraz Cavalcanti et al. showed similar favorable remodeling of the RV mostly between 1 and 3 years after PVR. No clear cutoff for preoperative RVEDVI that “guarantees” normal postoperative RV size has thus been identified. Furthermore, in a report by van Straten et al. RVEDVI decreased only marginally (2 ml/m2) from 7 to 18 months after PVR . This is supported by, Hallbergsson et al. 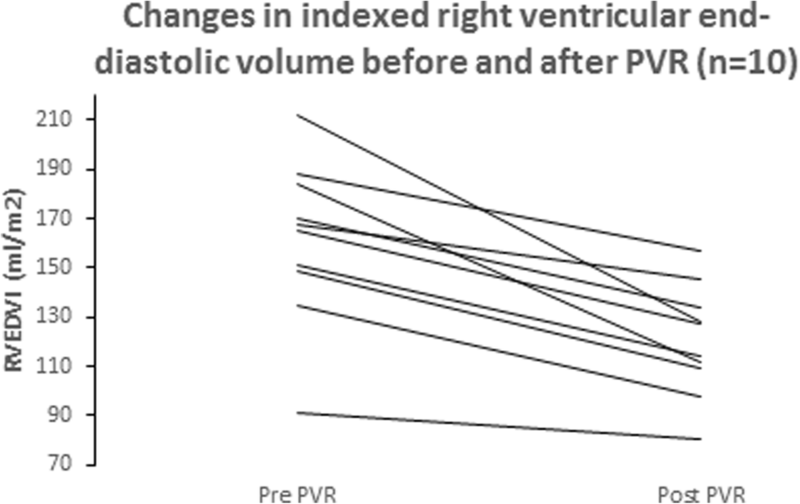 showing that favorable RV reverse remodeling early after PVR erodes during long-term follow-up, with a gradual return toward dilatation and pre-PVR values of RV size and function up to 10 years postoperatively. This is probably associated with increasing PI and pulmonary stenosis related to deteriorating function of the implanted conduit and, in some patients, volume load from tricuspid regurgitation. Therefore, given that the negative consequences of moderate or even severe RV dilatation are questionable, focusing on preoperative RV function appears to be more appropriate.